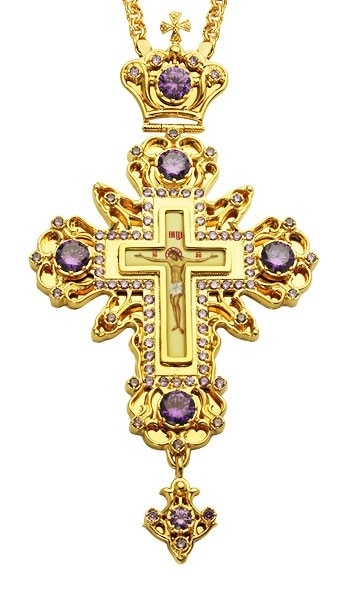 Pectoral cross - A24 (with chain) - Istok Church Supplies Corp. This Orthodox Christian clergy pectoral cross of medium size, resembling in shape an eight-pointed star, is made of brass and covered with high-quality gold-gilding, galvanized. The back wall of the cross is polished to a mirror finish. In large stones - phianite stones, the light from the gold-gilded "mirror" is repeatedly reflected. The crucifixion is made using a special technology of applying a color image on a brass base, it is covered with a composition that protects it from mechanical damage and exposure to light. To this cross there is a matching panagia, SKU PGA-0161LP-2.